Critical Care Western and the Critical Care Ultrasound Program are extremely pleased to announce that Dr. Vincent Lau, FRCPC (internal medicine and critical care) is the new critical care ultrasound fellow! We are delighted to have Dr. Lau in the program. 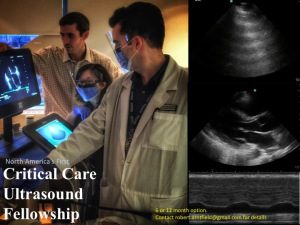 The only fellowship of its kind, the CCUS fellowship is designed to support the development of critical care physicians in to leaders in the emerging sub-specialty of critical care ultrasound. Scanning techniques, scholarly activity (research, educational content development and book chapters) as well as program management (quality assurance, administration and curriculum design) are the prevailing themes of the fellowship. For a full description of the fellowship, see this document. If you are interested in the fellowship please contact Dr. Robert Arntfield for more details. A pre-knowledge assessment for critical care echocardiography is below. Please take this assessment prior to your Critical Care Ultrasound Rotation and the Annual CCUS course.